Do you want to wear a party hat at your New Years Eve celebration party? How about making some of your own. 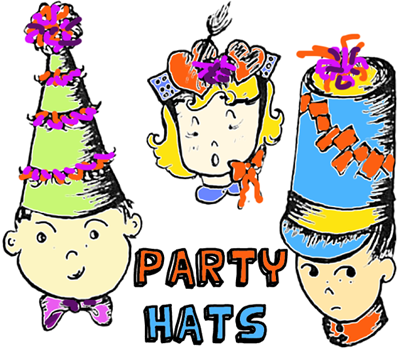 To make party hats, you will need 12 x 18 inch, colored construction paper, Scissors, Paste, Paper doilies, and other "special" decorative materials. Fold, cut, or tear paper to desired shapes. 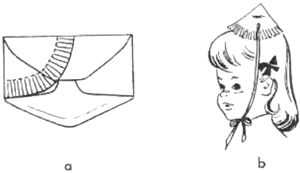 For a hat, straight and formal, such as in Figure 1, roll the construction paper to the size of the head and staple or paste together to form the coil. A top may be put on by cutting a circle larger than the top of the hat, slitting edges and folding them down so the remaining circle is the size of the top opening. Glue the split edges down inside the coil of the hat. Add visor, chin strap, and extra decorations. In Figure 2, you should make a pie shape out of a circle and draw it together and staple it to shape. Extra decorations may be added and a chin strap if desired. There are many versions of the party hats. Think of all possible shapes and trims and experiment with them (bows, squares, ribbons, tassels, stars, lacy effects, seasonal decorations). For this party hat you just need to glue shiny, colorful paper, metallic paper, or tin foil around a cylinder salt or oatmeal box. Then cut a small peak from cardboard and then also cover this with the same metallic foil. Attach the peak to the cylinder box with Scotch tape. Now, glue on yarn, ribbon, or a crepe paper pompon. Make the under-chin tie of yarn, string, ribbon or elastic. If you are in need of a quick New Years Eve party hat that is also easy and inexpensive to make...then here is the craft for you. These mail envelope party hats are just what you are looking for. Go and find some mailing envelopes and some pretty ribbons. You will require one envelope per party hat. Sketch a circle across an envelope (as seen in picture above). Then use a scissor to cut one inch slits into the circle you just drew. Next, punch a hole on each side of it and then run a a ribbon through the two punched holes. Now all you have to do is use the ribbon to tie the party hat under your chin...and the party hat should stay on nice and tightly. Make a Party Hat - Celebrate in style by making your very own party hats. Learn How to Make Crepe Party Hats - Get a food container and some crepe paper to decorate a great festive hat. Ideas for Costume Hats - Here are a bunch of illustrations on how to make quick hats for costumes.